To better help international students integrate into life and adjust to the rigorous academics at NTU, the Department of Civil Engineering is launching a program to encourage more international and domestic student interaction. 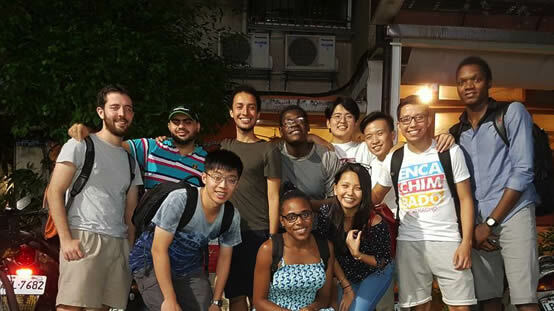 Students in the program will work together to organize and execute activities to promote intercultural understanding, compile and edit a guidebook for future participants, and assist international students with various aspects of living in Taiwan. Those who fulfilled the service program requirements will be awarded a certificate. The program advisor is Prof. Jen-Yu Han (韓仁毓教授). Prof. Han, serving as the Department Vice Chairman, has won many awards for his two-decade long enthusiastic devotion to research and teaching in civil engineering. His research interests include Applied Satellite Geodesy, Deformation Analysis, Time-variant Terrestrial Reference Frame, and Integrated Analysis of Hybrid Spatial Information. He also serves as editor or reviewer for various journals and research institutes. All Civil Engineering students are welcome to participate in this program. International students can sign up to be a service provider or a service receiver. Undergraduate degree students can apply for Service Learning III credit. 2nd Year of study or above; English or other foreign language ability if engaging with international students who do not speak Mandarin.